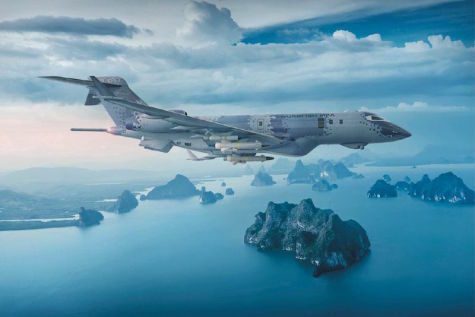 SEOUL --- Saab, a Swedish defense firm, argued Wednesday that its Swordfish maritime patrol aircraft (MPA) is an optimum model for use by South Korea's Navy, which is seeking to bolster its ability to counter North Korea's submarines, some of which are equipped with ballistic missiles. The Navy is eager to introduce advanced MPAs to add to the fleet of 16 P-3C and P-3CKs currently in service covering the waters around the peninsula. The Defense Acquisition Program Administration (DAPA), the state arms agency, will soon launch a long-delayed acquisition process with an announcement that it will buy MPAs from a foreign contractor. The program is reportedly worth 1.94 trillion won (US$1.81 billion). The DAPA is reviewing basic information on candidate planes before issuing a formal request for proposals to potential bidders. Initially, Boeing's P-8 Poseidon was considered the favorite to win the contract. But Saab made public its interest in the bid amid reports that Airbus and some other foreign companies may join the race as well. Saab is making a pitch for Swordfish, which is still in the making, an apparent disadvantage, versus Poseidon, which is known as the world's best existing MPA. Saab officials described Swordfish as a "real," not "imaginary," plane since it's based on Saab's GlobalEye airborne early warning and control aircraft, recently developed on the airframe of the Bombardier Global 6000 business jet. It has "70 percent of commonality" of systems with various other Saab products, with decades-long and far-reaching expertise. The remaining 30 percent is about integrating weapons and other systems, they said. "It's going to take roughly 36 months from order to delivery," Vice President Robert Hewson, head of the company's communications for Asia Pacific, said at a press conference in Seoul, although the exact schedule will depend on the customer's specific requirements. He claimed Swordfish is cheaper to get and own alike. Compared to Poseidon, it is "approximately two thirds the acquisition cost and 50 percent the operating cost over the lifetime," he said. "You will be able to buy more aircraft for a fixed amount of money. And the cost to own is much more important than the cost to buy." The price of a P-8 plane is known to be 250-280 billion won. It means South Korea will be able to purchase five to six P-8s if it chooses the aircraft. In case of Swordfish, the number increases to around 10. Saab is also willing to transfer some technologies to South Korea. Hewson, however, avoided a clear answer when asked if the active electronically scanned array (AESA) radar technology would be included. Swordfish will be equipped with the AESA radar that has 360-degree detection capability. Boeing said the Swedish plane, which is still untested, is no match for Poseidon in operation in many parts of the world. "The P-8 is proven and reliable. It has the best performance to support the Republic of Korea Navy's anti-submarine warfare," a Boeing official said. "Price is a matter of negotiation after the program gets underway in earnest." Poseidon's maximum takeoff weight is almost double that of Swordfish, capable of carrying more sonobuoys, weapon systems and crew members. South Korea's Navy officials openly said they hope for MPAs with the class at least of P-8. They also point out the interoperability with other U.S.-made assets in use by South Korea's military. The Saab official said Swordfish is smaller but not that small. "It's big enough to do what you need to do to carry weapons, carry systems, huge payloads. It outperforms larger aircraft," said Hewson. Saab's products have no problem in the interoperability with NATO's weapon systems," he added.